Just watched this documentary. It is a really excellent investigative look in to how and why the low-fat theory of nutrition became dogma. "Have you seen the news stories about the obesity epidemic? Did you see Super Size Me ? Then guess what ... You've been fed a load of bologna. Comedian and former health writer Tom Naughton replies to the Super Size Me crowd by losing weight on a fat-laden fast-food diet including plenty of double quarter-pounders and fried chicken while demonstrating that nearly everything we've been told about obesity and healthy eating is wrong. 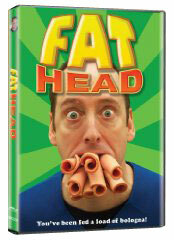 Fat Head features humorous animations as well as informative interviews with doctors, nutritionists, and political scientists." So for the people who watch this or have already seen it, what do you think? Leave your comments below. What padding would you use and what tape to keep the pad in place? Would you wear it all the time? Also, what did you mean by "releasing the trigger points". If you're referring to the Trigger Point book by Davies, then what should I start with in the Trigger Point book? A friend just actually loaned it to me along w/the hook tool just before I stumbled upon your comment in the Animal Pharm blog. I've had a really painful 'bunion' (Dr's call it) in my right foot (underneath the 1st joint/ball of food) since I started running about 3 yrs ago. When started doing CrossFit about a year ago it got worse. Weightlifting more and doing less CF (less running) seems to help, but I miss CF and my old hobbies that aggravate it (hiking, running). I have all the symptoms it seems with dysfunction in other places that I'd guess are related to my feet/posture, mostly on the same side (right side) such as knee issues, back issues, and scapula mobility issues. Something else I'm working on presently is learning the POSE method and I have been easing myself slowly into more minimalist footwear. Hi Remy- Thanks for looking me up. I'm working on setting up a "contact" page, but am pretty new to blogging and haven't figured it out yet. It looks like you're doing a lot of the right things, ie. figuring out whats wrong, working on posture, and easing in to minimalist footwear. What padding do I use? I have taken to cutting a pad out of an insole. I use a "superfeet" insole because the tend to resist compression longer. Every week or so I trace the toe pad I have, and cut out a fresh one. Probably any insole would work in a pinch. I've used a variety from duct tape to athletic tape, but the one I've settled on is a cloth-type medical tape called Durapore. You should be able to find it at any CVS/safeway/whatever. You're correct, I'm referring to the trigger point therapy workbook. Get this book, I consider it life changing. I fixed a plethora of my teammates injuries last year using this book. You can use the techniques in there to fix all kinds of body issues. Go to the section on "morton's foot"- it will tell you all the muscles that tend to be effected, then use the index to look up those muscles and get massaging. A lacrosse or tennis ball is going to be your best friend. It will be painful.. I used techniques from the 1, trigger point book, 2, esther gokhale's "8 steps to a pain free back" and 3, "Why you really hurt" to fix my feet and subsequently the rest of me. They are all great, especially the first two. Let me know if you have any other questions and how it works out for you. Awesome. Thank you so much! I made pads and taped them on this morning. I have Davies' book and will work on finding Gokhale's. I'll let you know how it goes. Looking at the diagrams online and in Davies' book, I have very slight mortons foot (1st metatarsal ~3-5mm shorter than the 2nd). Also, the 'bunion' is on the right foot only, and all the dysfunction/pain referral issues I have are only on my right side (so far). So I'm wondering: should I put the pads on both feet or just the right? Seems like the answer would be both... I guess we'll see.